National City has a rich history of 125 years, but even more impressive is what the city is today – and what it will be in the future as it becomes the economic hub of San Diego’s South County region. National City is home to more than 2,500 businesses. The city has a well-established reputation for being business-friendly, and with approximately 60,000 residents, the number of businesses per capita in National City is remarkable. The retail scene in National City is particularly dynamic this year, with many new stores and restaurants moving into the city. The biggest headline so far this year came with the locally owned and operated Mor Furniture for Less opening a new store at the old Circuit City site. The store space, which served as the anchor for Town & Country Center, had been vacant for more than a year. A significant transformation is underway along a major thoroughfare of National City. The transformation, known as the 8th Street Corridor Smart Growth Revitalization Project, was solidified after a $40 million bond sale to finance the work was completed in March. National City staff, National City Chamber of Commerce representatives and National City residents worked closely together to create the vision for the 8th Street Corridor Smart Growth Revitalization Project. For 57 years, National City’s Mile of Cars has played an important part in the community. To date, the automotive association, comprised of eight dealers and more than 18 franchises, has sold more than 500,000 cars, representing at least one million customers served. One of the largest and most successful automobile associations in the country, as well as one of the most recognizable business names in San Diego County, Mile of Cars was recently named one of San Diego’s Top 100 Brands by the San Diego Ad Club. Starting a business involves following numerous steps and getting approvals and services established from various public agencies and other organizations. In 2008, the Westfield Group completed a $130 million renovation of Westfield Plaza Bonita. Today, the indoor mall houses more than 170 stores and eateries, and attracts shoppers from San Diego’s south county and beyond. Westfield Plaza Bonita has long been a business institution in National City and is a prime example of the revitalization taking place throughout the city. Getting down to business is a prevalent theme in National City these days, due in large part to an active Chamber of Commerce that promotes the welfare of the city’s growing business community. Ask most businesses why they locate where they do and they’ll mention location, land costs, rents, transportation access and the like. But, they’ll also talk about a community’s livability, according to Robert (Dukie) Valderrama, a life-long resident and current chairman of the National City Chamber of Commerce. 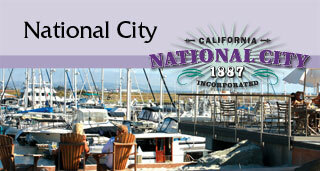 National City has emerged as a major bayside business and tourist venue with several major facilities in place, and more to come. Education is an important priority in National City for a variety of reasons. Six of the city’s 10 elementary and middle schools have won recognition for excellence at state and national levels. Work is now complete on an extensive remodeling and expansion project at the city’s historic high school campus. And, a unique community college center provides residents with a rich selection of college courses. Companies of all sizes and types are attracted to business-friendly environments, such as National City, where the city encourages economic development. A major part of National City’s pro-business “toolbox” is its Enterprise Zone that covers roughly 95 percent of the city. National City leaders say they adopted the slogan “In the center of it all,” because it best describes the city from several perspectives.